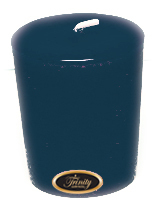 Trinity Candle Factory Premium Scented French Market - Votive Candle - Single. This votive is approx. 1 3/4" x 2" and fits all standard votive holders. Premium scented for maximum fragrance throw. With a 15-20 hour burn time, cotton wick and premium scent, this candle is a great find. This French Market candle is a special blend of florals with the top notes of gardenia. 100% Satisfaction Guarantee. Trinity candles are awesome. A friend recommended them and I decided to give them a try. The French Market and French Vanilla are my favorites so far. This is the BEST fragrance. Please never stop making it. I ordered the jar candle too and the oil scents. Love, Love, Love it.